View More In Holsters - Page 2. MBLAI dedicate to provide Amazon customers with high quality products and excellent service. All the cases that we are selling are stylishly designed and produced with care to ensure an exact fit for the daily functionality of your device and maximum protection, following the principle of "MBLAI= Making Better Life Always In".And it's all sold at a reasonable price. So shop with confidence. If there's any question, please feel free to contact MBLAI customer service. We'll offer you the best solution. 100% new brand in high quality with high-impact polycarbonate hard outside shell, inner durable silicone slipcover work as a heavy duty case, offer toughest protections for your phone from drop, scrapes, dirt, bumps and shock. Accurate cutouts allows for direct, easy access to ports, camera, earphone, buttons, and all features on your iPhone. Convenient way of unlocking your iPhone Unique Fingerprint Identification Function provides . Easy on/off functionality. User-friendly hands-free design for a holster with belt clip, which you can hang on your wrist when go out for sports, biking, running or can be a kickstand when watching movies, use your apps or get caught up on work emails. MBLAI powerful defender case provides multiple protections for your phone: Drop protection, dust protection, screen protection, scratch protection and anti life water (like drizzle, sweat, water drop, etc.). ★Compatible with all version of iPhone 7 Plus & iPhone 8 Plus carriers (AT&T, Verizon, Sprint, T-Mobile, International). 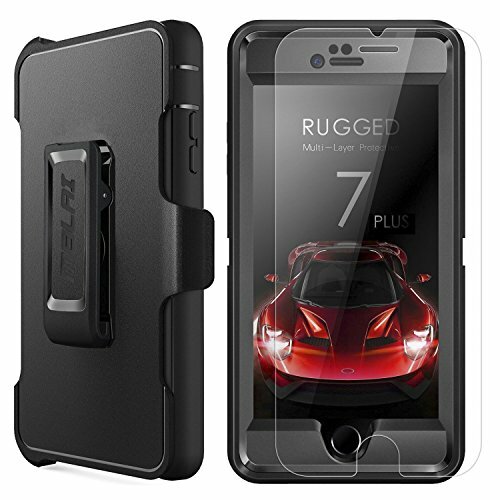 ★MATERIAL: Hard plastic inner and soft rubber silicone outer construction absorbs shock bumps and drop.Raised beveled edge keeps your touchscreen safe,accurate port plug allow for easy access while keeping out dust and debris. May not be compatible with 30-pin to Lightning Adapters or non-Apple branded USB to Lightning cables. If you have any questions about this product by MBLAI, contact us by completing and submitting the form below. If you are looking for a specif part number, please include it with your message.